The configuration tool allows the user to edit the standard configuration of EDGE, including Captions, EDP Export, Enumeration Values, Format Sections, and Tabs. To access the EDGE configuration tool, navigate to the Plugins sections of the ribbon and click on the EDGE Configuration button. Tip: If the configuration tool button is missing from the ribbon, please check the \EDGE\Plugins\Tools folder for the required "EDGE Configuration.dll" file. If this is missing, please contact support@earthsoft.com. Three virtual fields appear throughout EDGE: ALERTS, LOCATION_NAME, and TIME. These fields are referred to as "virtual" as they appear in the EDGE user interface for ease of reference for the user. However, they are not present in the EDGE format, and the captions cannot be edited within the Format Section of the Configuration tool. 2.Add the required caption to the Custom column for each field. 4.Check the caption edits by navigating to a place in EDGE that features the field, such as the Field Samples tab, which shows the Alerts field. If a location record in LOCATION_V1 has EDGE_UPDATE_YN set to "N", that location record will remain in the EDD, but a database record will not be created for it in DT_LOCATION during the Create step in EDP. When location data are created or edited from within EDGE (e.g. in the Location tab), EDGE automatically sets LOCATION_V1.EDGE_UPDATE_YN to "Y" for the new or edited locations. If Disable Locations is enabled in EDGE Configuration > EDP Export, all LOCATION_V1.EDGE_UPDATE_YN values will be set to "N" after completing the EDP Export process in EDGE. Therefore, no location data in the EDD will be uploaded to EQuIS when this feature is enabled. These are values that are stored within the [Format]-enum.xml file, allowing the user to set any field as a drop-down from the enumeration. To create a new enumeration list, click the New button. The user will prompted to name the list as well as define the maximum value length (number of characters) for the members of this list. To manage an existing enumeration list, complete the steps below. 1.Select the enumeration to be edited within the left window, under the enumeration node. 2.The enumeration values are displayed in the right window. 3.To add a new value, click the Add to List button and enter text. Note: Use of commas (,) and blank space can cause drop-downs referring to enumerations to fail in EDGE. 4.To edit a value, select the required enumeration from the list and click the Edit button. The Edit Form will be displayed, allowing the user to edit the text. 5.To delete a value, select the enumeration and click the Delete button. A warning message will be displayed. Click OK to continue with the deletion. 6.To edit the display order of the enumerations, select a value from the list and use the Value Up and Value Down buttons. Values listed in a drop-down that references an enumeration will display in the same order that is set in the Configuration Plugin Tool. This allows the user to place more commonly-used values at or near the top of the list, for ease of access in EDGE. 7.To add multi-select support to the enumeration, meaning that more than one value can be selected within EDGE, check the separator check box and type in a separator which will be used within the display string when more than one value is selected. For example, to enable the selection of multiple color values and have each choice separated by a comma (,), select the color enumeration, check Multi-Select Separator and enter a comma in the box. Note: Instead of supplying drop-down lists on EDGE fields, some enumerations will change functions of EDGE depending on which value is listed first. Examples of these kinds of enumerations are those related to the Sample ID Builder. 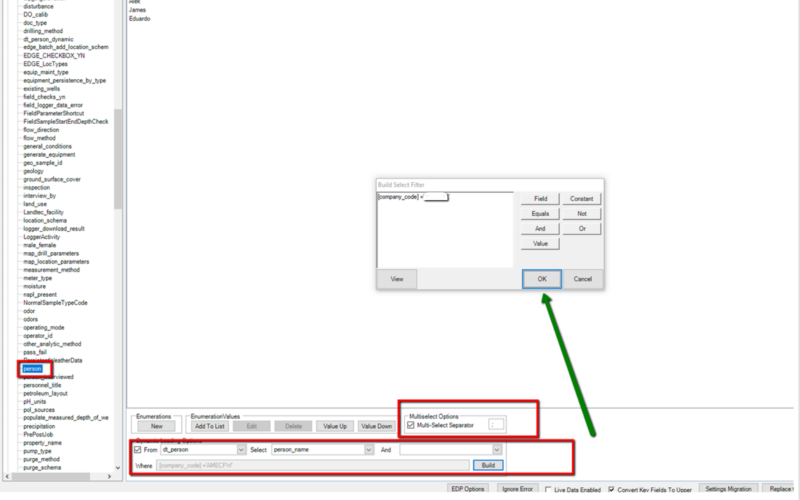 - The user selects to lookup in the dt_person table, filtering the person_name based on company_code (Build Select Filter in the figure below). A full content of the dt table is available through the rvf file. The relationship between the dt table and the rvf file is represented below. As seen from the figure, the person selection is based on the dt_person table, showing the person_name, based on a lookup for company_code (as shown in the Build Select Filter, figure above). After installing a new EDGE version, the user may wish to transfer particular settings from an existing install (older version). This is done using the Migrate All, Replace Config and Update Enumeration in the Configuration Plugin Tool. Migrate All will migrate the EDGE settings file as well as the current format's enumeration and configuration files. This process is explained in detail in Migrate Settings, Enum and Config. The settings, enumeration or configuration files can be individually migrated using the other buttons. Each one will prompt the user to navigate to the new file to migrate in. The settings file saves changes to Application Options and visible tabs. The Configuration file stores changes to the data tabs that are made in the Format Sections area of the Configuration Tool. The enumeration file saves enumeration lists as explained above. Note: When using these functions within the EDGE Configuration Tool, the target file will be overwritten. Please rename/backup the target file if you may wish to restore it. Note: Only Format Sections assigned to group "field" in the format .xse/.xsd are accessible in the configuration plugin. Select the Format Section to edit within the left window under the Format Section node. There are two tabs, one for editing the columns within the Format Section, and the other for editing the file attachment properties. Any default format settings are highlighted in blue text, and any that have been over-ridden are in red text. Caption - The caption column allows the user to set a caption for the selected column name. This caption will be displayed when the column is shown. Default Value - This sets the default value to insert within the column when a new record is created. Lookup - This allows the user to set a column to look-up the reference values or enumeration lists, and gives the ability to filter the chosen lookups. 1.Choose the reference table, enumeration list or other data sections/fields in EDGE from the lookup column drop-down. If the desired lookup is not available in the drop-down, go to Create a Reference Values File (.rvf). 2.Select which column within the lookup destination to display by selecting a value from the lookup column drop-down. 3.To include an extra column within the drop-down, select an additional field from the drop-down under include column. a.Select the data field on which to filter in the filter column drop-down. b.Type a string into filter value. It will filter out all records where the filter column value does not match the filter value string. d.The foreign filter and related filter columns allow you use another data field in EDGE to dynamically filter the lookup list on the target field. When set up, the user would enter a value in one field and based on the entry there, another field's drop-down list would be filtered. •If no value is entered in custom_field_1, all RT_LOOKUP.LOOKUP_CODEs that do not have REMARK populated will be available for selection. Required - The user can make EDGE hold additional fields as required within the opened format by checking the Required check box for the column. Fields that have Required checked with blue highlighting in the cell are defined as required in the format and may not be unset as required. 2.Select which configuration file you wish to use to replace the current configuration file. This will transfer the configured settings (e.g. 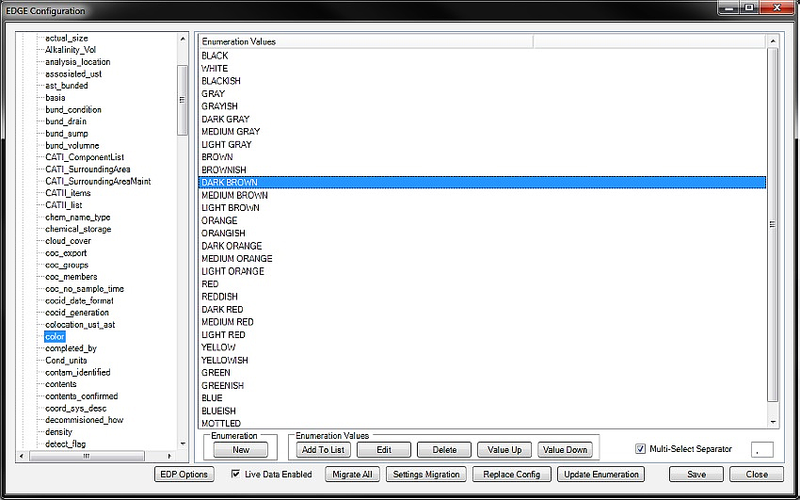 custom field captions and default values) to the new version. Note: When using Replace Config within the EDGE Configuration Tool, the target file (EDGE_Config.xml, for the standard EDGE format) will be overwritten. Please rename/backup the target file if you will need to restore it. 1.Select the Enabled check box. 2.Set values for the "Place type," "Place code," and "Place sub-code" that will be entered within the DT_FILE record when a file is attached. 3.Filter value enables you to set a filter for the file browse dialog. a.File filtering is optional. If not defined, EDGE will use the default filter: jpeg, jpg, raw, all files. For each filtering option, the filter string contains a description of the filter, followed by the vertical bar (|) and the filter pattern. The strings for different filtering options are separated by the vertical bar. b.Monitor Picture Folder - when files are added to the picture folder any tabs that have this setting enabled will display the new files within the directory. When the picture cell in the row is clicked, a form will display showing all the newly added files. This section allows the user to edit the display name of tabs and titles of forms, and also to choose whether or not they appear in the EDGE Data Tab Chooser. 2.To edit the display name of the tab, edit the value in the text box of the Tab Caption column. 3.To edit the title that appears in the header of a form, edit the value in the Form Title column. 4.The Available check box may be used to make the tab visible or not visible in the Data Tab Chooser. Note: Making a tab unavailable also means that EDGE will not load the tab/form in the background on start up. You can improve performance and start up time in EDGE by reducing the number of available tabs. Check or uncheck all tabs using the tools located at the bottom of the form. This is useful for when setting up your first configuration. 5.The Location Type field helps define what the form is used for. Once set for a form, creating a new form record will produce a warning if the location currently selected in the Location Chooser does not have the same Location Type. A location's Location Type can be checked or modified in the Location tab's LOC_TYPE column. EDP Options - To manage appearance settings for EDGE and the version of EDP integrated into EDGE, See the article EDP Settings for more details. Ignore Error - This dialogue allows users to decide if certain types of data errors should not produce error alerts in the Location Chooser or form tabs. See Ignore Error for more details. Live Data Enabled - Enables or disables the use of EQuIS Live tables, as explained in more detail in Turn On/Off Live Sections in Format. Convert Key Fields To Upper - This option, enabled by default, will capitalize the primary key fields to upper-case. Disabling this option is not recommended for users who submit data to Oracle database because those databases are case sensitive. EDGE will give this same warning when the user un-checks this option.